Michael Diamond Resnick (photo ©pyropyga) was born on March 5, 1942 in Chicago, Illinois. Mike Resnick studied at the University of Chicago between 1959 and 1961. There he met Carol, who became his wife in 1961. In 1962 their daughter Laura was born: as an adult she became a writer as well. In the ’60s and until the early ’70s, Mike Resnick wrote over 200 adult novels under various pseudonyms, he was the editor of seven tabloid newspapers and three magazines for men. He also produced a weekly column on horse racing and for eleven years he wrote a monthly column about purebred collies, which he bred and exhibited with great success together with his wife. Mike Resnick and his wife considered themselves science fiction fans and since 1963 they attended many conventions. On five occasions, participated in the masquerade contest at Worldcom wearing costumes made by Carol and won four times. In 1967, Resnick published his first science fiction novel, “The Goddess of Ganymede”. In 1976, Mike Resnick and his wife Carol bought the Briarwood Pet Motel, a kind of resort for animals, in Cincinnati and for some years they worked full time to run it. Their success allowed Resnick to hire a staff that would manage the business and he could devote himself to writing, This time it in the field of science fiction. The first science fiction novel by Mike Resnick in the ’80s was “The Soul Eater” but the most important was “Birthright: The Book of Man”, which describes a future history of humanity and has become the basis for most of the following Resnick stories. The fictional universe created by Mike Resnick for his future history includes millions of worlds through thousands of years. In this vast landscape, the author has created a series of sub-cycles that explore various topics. In recent years for example, he’s writing a number of novels in the Starship cycle, which started in 2005 with “Starship: Mutiny“. Mike Resnick loves fables and legends but some of his novels are allegories of Western colonialism in Africa, a continent he loves very much and has provided various inspirations for his stories. Humor is present in various ways in most of his stories, even the most dramatic. 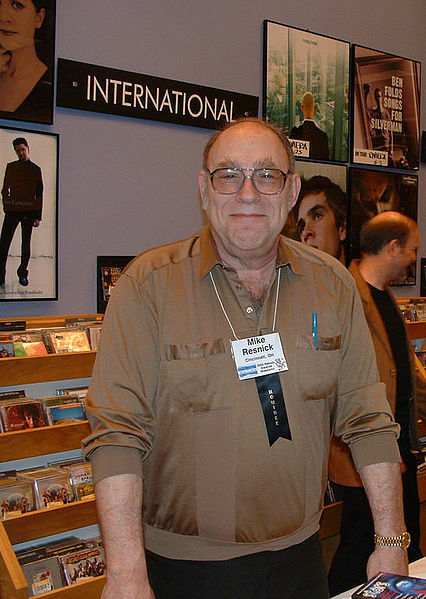 Mike Resnick has won 5 Hugo Awards, with the short story “Kirinyaga”, the novelette “The Manamouki”, the novella “Seven Views of Olduvai Gorge”, which also won the Nebula Award, the short story “The 43 Antarean Dynasties” and the short story “Travels With my Cats”.